The LOGFONT structure holds information about a logical font. in units of 1/10 degrees. Windows 95, 98: This must be equal to lfOrientation. Windows 95, 98: This must be equal to lfEscapement. 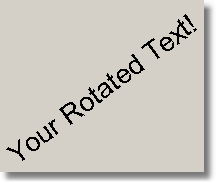 The average width of the font's characters. FW_DONTCARE = 0 Default weight. FW_THIN = 100 Thin weight. FW_EXTRALIGHT = 200 Extra-light weight. FW_LIGHT = 300 Light weight. FW_NORMAL = 400 Normal weight. FW_MEDIUM = 500 Medium weight. FW_SEMIBOLD = 600 Semi-bold weight. FW_BOLD = 700 bold weight. FW_EXTRABOLD = 800 Extra-bold weight. FW_HEAVY = 900 Heavy weight. A non-zero value if the font is italicized, 0 if not. A non-zero value if the font is underlined, 0 if not. A non-zero value if the font is striked out, 0 if not.